This week was the end of my second week back to work. I'm doing OK, still need reminders, here or there, but most pertinent issues get resolved. I am happy to see my desk uncluttered with manageable groups of paperwork, tidily kept in their little cubbie-shelves. Friday was the last day of several people, but I only made cakes for the known departees (in the same morning, we were surprised with news of a few who were also leaving, but to different departments/roles). I would call these cakes "6-inch mini cakes" because they were between 2.5 to 3 inches high (normally, it's 4 inches). Both cakes were chocolate sour cream with vanilla Swiss meringue buttercream icing. The pink cake was for the summer student, which I girlified. 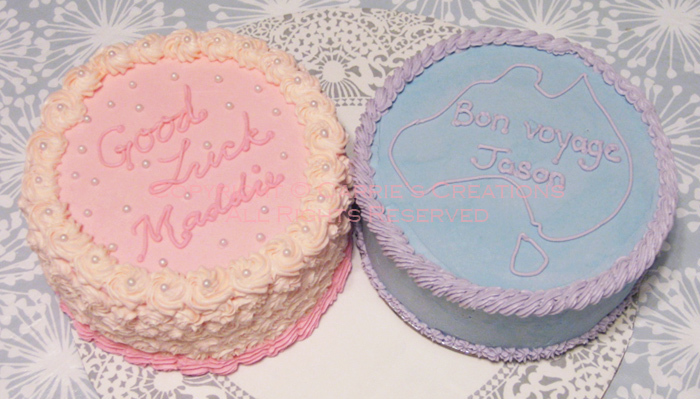 The blue cake was for the Australian-bound traveller. Both concepts were simple, because I basically do not have as much time to prep and decorate during the week. Plus, they also had to survive my 2-hour morning commute (GO bus, then subway, then bumpy bus ride). Good luck, Maddie and Jason! 2 posts in one day?! Well, today was the last day to post, otherwise, I wouldn't have time to do so during the week. This was a Disney's Cars request. My client wanted Lightning McQueen cookies (no problem, now that I have my food-safe printer). 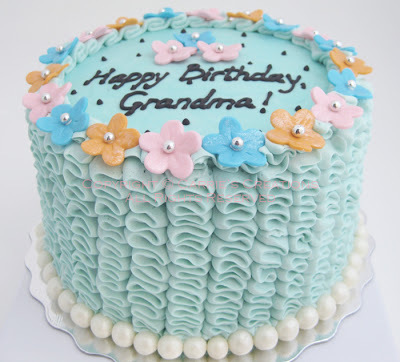 This was my second attempt with edible images, so another lesson learned: don't put the image immediately onto the wet icing, as the image sank into the icing and created a little depression (easily fixed by piping a border onto the icing sheet edge). I guess it's the weight of the paper that caused the dip. They turned out awesome! 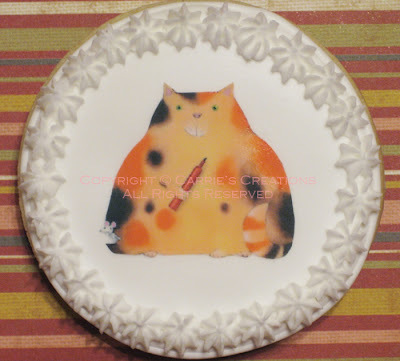 Here is an image of cookies for a little girl's birthday, based on the titled character, Chester, by Canadian author Mélanie Watt. This was a great time to test out my printer that prints edible images. Prior to the actual print job, I looked online for a circle template (the package didn't say where to get one and eventually, the found it on the website of the store that it came from). It was a fiddly process, because the circles on the sheet didn't match up to the template (!!!) and reading the advice of the virtual community, I practiced on regular paper until the alignment matched the icing sheet. Then it was just a matter of placing it on the flooded cookie (I decided to cut around the image, first). I thought that it was OK to brush corn syrup onto the back of the image (my cookie icing had already dried and I read too late that images need to be put on WET icing). But, lo and behold, the next morning, I find air bubbles underneath the image! :( Luckily, I was able to smooth the bubbles out. 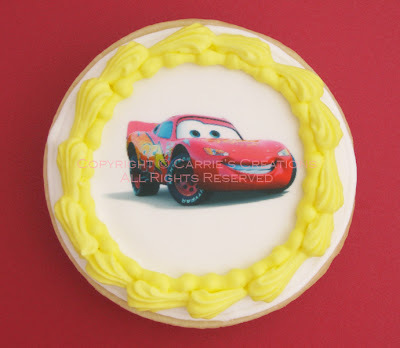 Lesson learned: place images right onto wet cookie icing. 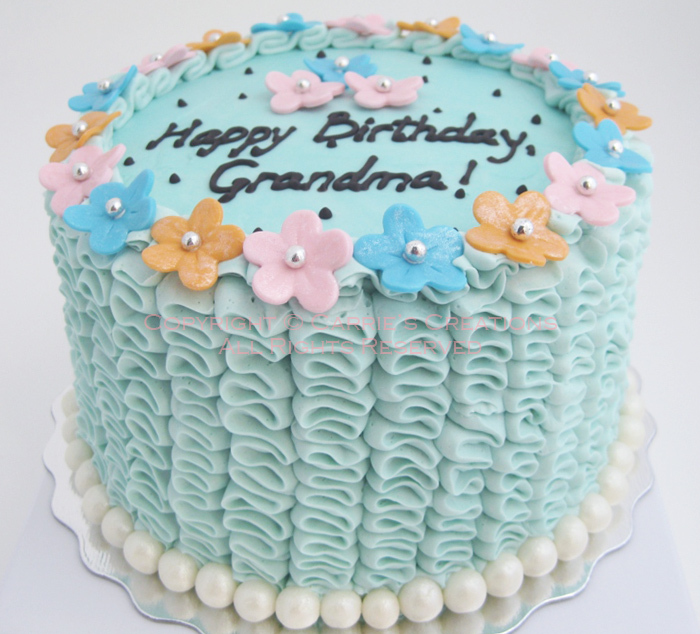 This cake was based on an existing design (source unknown; the client provided me with the image). But the only thing that was the same was the square layout. The top tier was chocolate cake; the middle, vanilla; the bottom, chocolate surrounded by vanilla. The original concept was to only have white chocolate ganache as the final layer. However, the ganache was not opaque enough (the 3 cake layers showed through), so a layer of white fondant had to be added. The filling was orange orange-flavoured Swiss meringue buttercream. 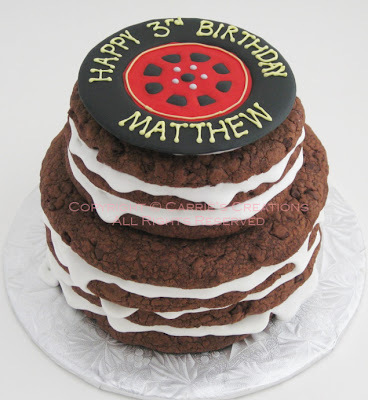 The black beads were made from chocolate marshmallow fondant. 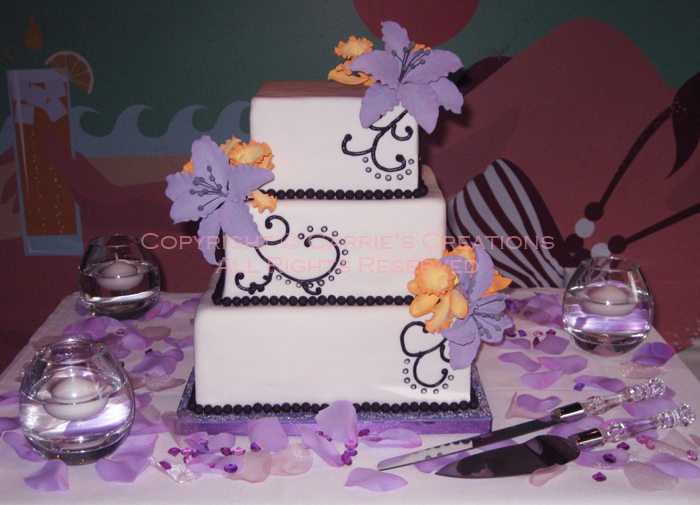 The purple lilies and orange orchids were gum paste. The cake board was purple royal icing with sanding sugar. This was also my first tiered cake to be stacked on-site. I'm half-glad for this because the bottom 10" tier alone probably weighed 30 lbs or more! Not-so-glad because the product is incomplete when it leaves home-base, there's more pressure to finish in a certain window of time (I was there for an hour when I thought I'd be done in 30 minutes max) and a lot of things can happen at the venue. I had a request to make a cake for a birthday that had to have flowers on it. We decided on chocolate cake with whipped cream filling and Swiss meringue buttercream icing. I wanted to try out the ruffle technique, and I loved how it turned out! The flowers were made from marshmallow fondant (MMF) with silver dragee centres, and they were painted with pearl lustre dust. The text and dots were piped with dark chocolate. The pearls were made from MMF, too.